"Sharks Are Our Friends not Food"
It’s a modified line from the film Finding Nemo, but it's true. There is growing global concern among chefs over “finning”, which is the illegal practice of cutting off a shark’s fins and discarding the remaining mutilated body into the sea. The practice has been banned for United States fishermen since 2000. Now President Obama, in support of this concern, has signed the additional Shark Conservation Act into law, significantly strengthening shark conservation both nationally and internationally. 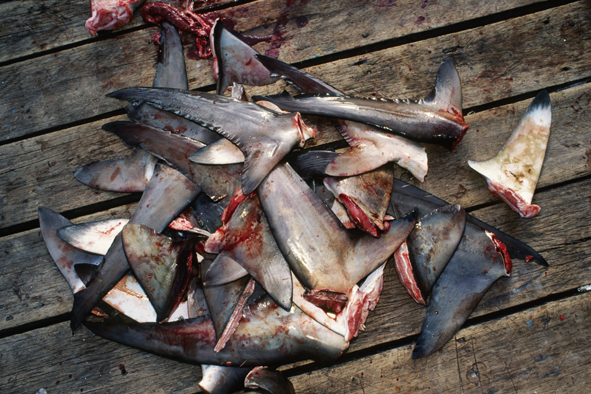 The new law allowing sanctions to be imposed on nations that have not implemented shark fishing regulations consistent with those placed on U.S. maritime industry. Despite their fearsome appearance, more individuals are injured by lighting worldwide than by shark attacks. Sharks have held a valued place in the sea’s environment chain for millions of year. Destroying them just for a body part is both wasteful and irresponsible. If you are wondering how to draw your staff’s attention to this concern, an insightful product from Air Swimmers can help you make an impression. Their life-size inflatable shark is guided by remote control and literally swims through the air. It is amazing and truly unforgettable. Posted on September 30, 2011 by Ana Kinkaid and filed under Chefs, Cooking, Cuisine, Films, Leadership, Movies, Professionalism, Restaurants, Sustainablity, Trends, White House and tagged Air Swimmers Finding Nemo Finning President Obama Shark Attacks Shark Conservation Act.